STEELCO gutter screens can be easily installed on metal roofs with ridges, like the one pictured on this page. 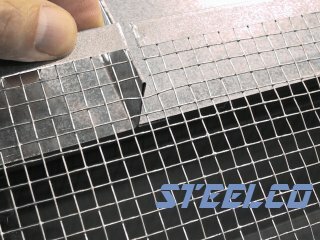 Simply use your tins snips to remove a row of mesh, as shown. Only a small gap is needed. This will allow STEELCO screens to lay flat against the metal roof. The rest of the installation depends of the type of gutters you're working with. For K-style gutters, see the typical install method. For half-round gutters, see the alternative install method. If you have trees, NO product (regardless of their claims) will make your rain gutters 100% maintenance free. Such claims are without merit. The object of gutter protection is to prevent gutters from clogging and overflowing. STEELCO gutter screens are designed to keep out large leaves and debris that can block a downspout and cause the gutters to overflow. Tiny debris small enough to pass through the mesh will eventually get washed out of the gutter system in a heavy rain by the movement of water as it runs to the downspout. However, over time, some sediment can accumulate in the gutters. Gutters should be inspected each Spring and Fall, or at least on an annual basis. If the gutters need cleaning, water can be sprayed through the gutter screens with a hose, flushing the sediment to the downspout. Unlike solid gutter covers, there is no need to remove the screens to service the rain gutters this way... another advantage of premium STEELCO gutter protection.